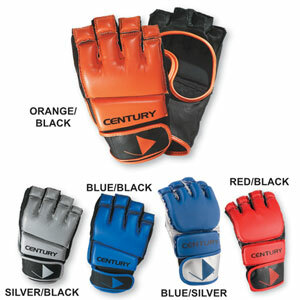 These are one of the most popular MMA grappling gloves that Century offers. These have an open palm design. Again these MMA training gloves are four fingered gloves with a thumb loop integrated into the wrist strap. The thumb being free helps your grappling skills. It is easier to hold on. The fingers are short to allow a better grappling glove. The palm on these are made with leather. The rest of the glove is made from a PU covering. Dense foam covers the back of the hand and fingers. These gloves seem to hold up nicely in the ring as far as wear. The difference in these gloves and the gloves listed above are the materials used to make the gloves. The gloves are constructed the same. These make a great training glove and competition glove. The sizes are not as custom as the above gloves coming in Small/Medium, Medium/Large or Large/XLarge. There are a variety of colors featuring Orange/Black, Silver/Black, Blue/Black, Blue/Silver, Red/Black. Here is what Jason Keis has to say about this BJJ System. You guys have put together another amazing system. Mixed Martial Arts is the most demanding sport there is. If you're not in fight shape you're going to get hurt in there. Conditioning programs for MMA must include speed, strength, power, endurance, cardio and flexibility training. These Guys have incorporated all of these aspects of training into their systems. You don't have to be a professional fighter to be in great shape; you just need to make yourself do the work. To find our more just read on... BJJ Fitness and Conditioning.